This story could have called for a few customs but since I didn't have time, they were done in the computer. 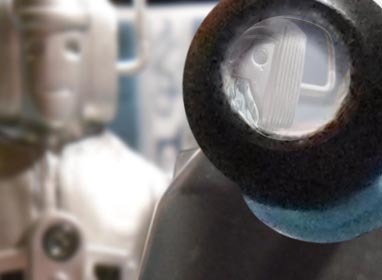 The first is the Power Cyberman in part one- made by adding an 'Invasion' head to a '10th Planet' body. 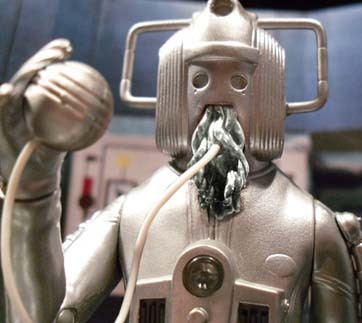 The second was 'The Psiberman' which, in the storyline, was described as "a cyberman with a bulbous head" but during the shooting I hit upon the idea of making him a cybernised Ood. Extra pictures had to be taken in order to do it. The last one is the Cyberneticised Dalek in part two. 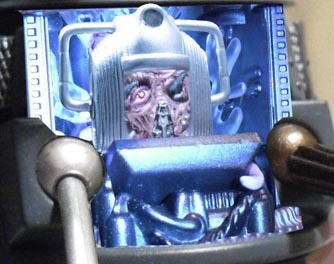 For this I used an open toclafane as base, modifying it to give it one eye and adding various cyberman components. The plan with this second instalment was to show the Cybermen as worthy opponents to the Daleks. I wanted to give the daleks a real hammering. For every strategy they adopt, the Cybermen have already anticipated and have a counterplan. 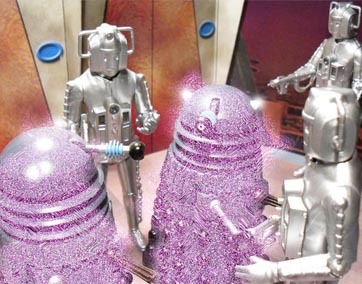 A couple of ideas didn't make it- one was to give the Cybermen a laser cutter that cut into dalek casing. Another idea was to have a suicide Dalek (ala Destiny of the Daleks) that would take out swathes of invading Cybermen. One thing that didn't make it into the finished script is the answer to the Dalek's first question on page 1. 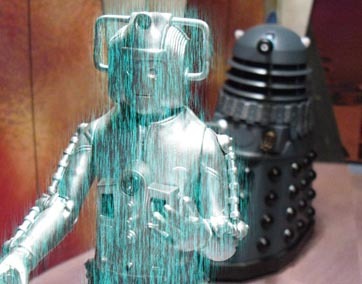 How did the Cybermen get the codes to the orbital defences? Obviously the Master gave it to them. 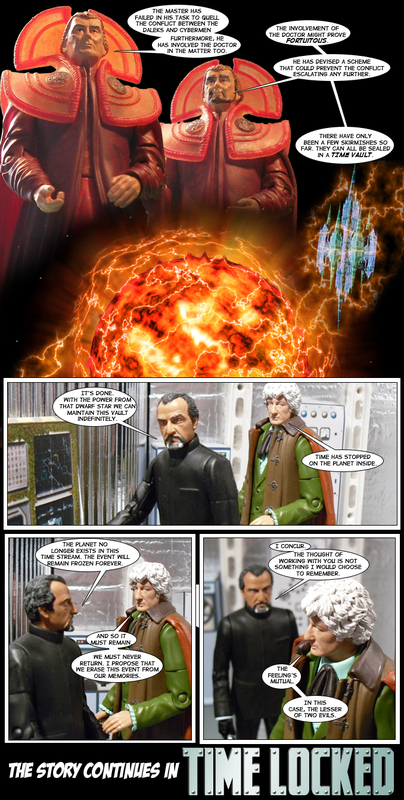 I had the idea of putting Jo Grant or the Brig (very recently released) in a cameo scene in the Doctor's lab but since this added nothing to the plot and slowed the story, I nixed the idea. The script was completed on 2 April 2012. Shooting began for the entire DvC series on 1 Sept 2012 with the TARDIS interior scenes, in the case of this story the TARDIS was redressed to be the Master's TARDIS using the original console, putting some green paper behind the roundels and dressing the set with various bits and pieces including an egyptian statue from Indiana Jones, a Cyber controller that I made years ago and the Master's computer TARDIS from The Time Monster. On 8th October 2012, I shot the interior of the Dalek saucer with the supreme from Planet of the Daleks. 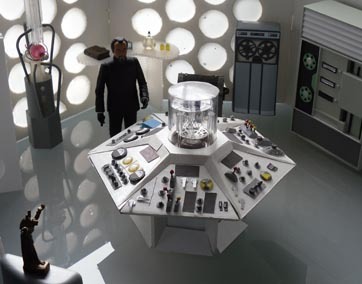 Next up was the dalek control room (17 Jan 2013). The design of the Dalek city is based on that from the 60s movie Dr Who and the Daleks- I always loved that city with it's gold walls and giant bank of scanners and screens which I tried to hint at. The rest of the upper city scenes (corridors, the damaged corridor) and the damaged lower room were shot on 19th Jan. The lower corridors (shot 20 Jan) are deliberately reminiscent of the Pertwee story Planet of the Daleks. The Doctor's UNIT lab (26 Jan) is from The Three Doctors and uses the Master's grandfather clock TARDIS from The Keeper of Traken. The petrified jungle was created using scrunched paper for the brittle trees. The power packs on the Cybermen's backs are from the Doctor Who Adventures magazine. This was filmed mid Feb.
A short exchange between the Doctor and the holographic Master in part one was removed just before editing. 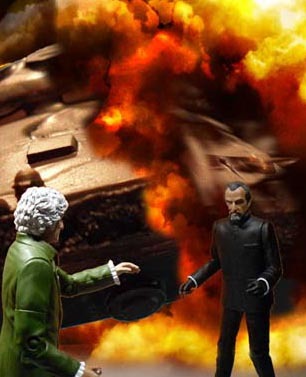 Here we see the Doctor relent and go off to help the Master. I felt it would add more mystery if that was taken out allowing the reader to wonder just a little bit longer if the Doctor would really abandon his old enemy? Part One was put on the web on 23 February with Part Two following two days ahead of schedule on 21 March. 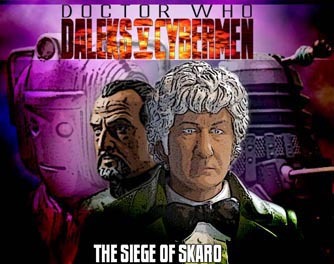 At this point in the proceedings I hope you're starting to see that there is a plot behind all this and it's not just a monthly skirmish between the Daleks and Cybermen.